Topical Tazarotene blocks ornithine decarboxylase (ODC) activity, which is associated with cell proliferation and hyperplasia. Tazarotene suppresses expression of MRP8, a marker of inflammation present in the epidermis of psoriasis patients at high levels. In human keratinocyte cultures, it inhibits cornified envelope formation, whose build-up is an element of the psoriatic scale. Tazarotene also induces the expression of a gene which may be a growth suppressor in human keratinocytes and which may inhibit epidermal hyperproliferation in treated plaques. For psoriasis: Apply once daily in the evening usually for up to twelve weeks. Use and dose must be determined by the doctor of children upto 12 years of age. For acne: Cleanse the face gently. After the skin is dry, apply a thin layer of Tazarotene cream once per day, in the evening, to the skin areas where acne lesions appear. Use enough to cover the entire affeted area. 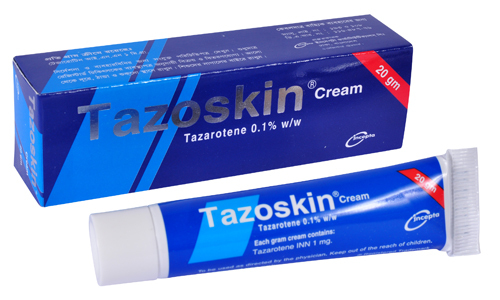 Generally Tazarotene cream is well-tolerated .The most frequent adverse events related to treatment with Tazarotene are skin-related as for example pruritus, erythema, burning, irritation, desquamation, stinging, contact dermatitis, dermatitis, eczema, worsening of psoriasis, skin pain, rash, hypertriglyceridemia, dry skin, skin inflammation, and peripheral edema. Tazarotene cream should be applied only to the affected areas. It is for external use only. Avoid contact with eyes, eyelids, and mouth. If contact with eyes occurs, rinse thoroughly with water. Retinoid should not be used on eczematous skin, as they may cause severe irritation. Because of heightened burning susceptibility, exposure to sunlight (including sunlamps) should be avoided unless deemed medically necessary and in such cases, exposure should be minimized during the use of Tazarotene cream. Tazarotene cream should be administered with caution if the patient is also taking drugs known to be photosensitizers (e.g., thiazides, tetracyclines, fluoroquinolones, phenothiazines, sulfonamides) because of the increased possibility of augmented photosensitivity. Pregnancy: There are no adequate and well-controlled studies in pregnant women. Although there may be less systemic exposure in the treatment of acne of the face alone due to less surface area for application, Tazarotene is a teratogenic substance. It is not known what level of exposure is required for teratogenicity in humans.